1. An ellipse is the figure consisting of all those points for which the sum of their distances to two fixed points (called the foci) is a constant. The greater the eccentricity is, the more elongated is the ellipse. Say is a fixed point of the ellipse. a Find the length of the major and minor axes. 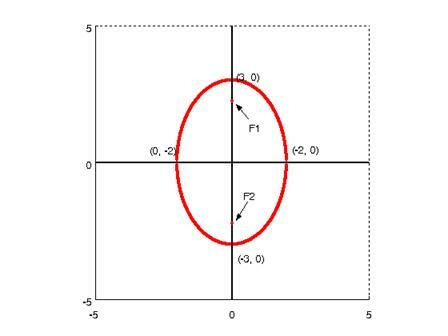 We see that the center of the ellipse is (h, k) = (2, -1). Next, note that a = 3, b = 2. We know that the endpoints of the major axis are exactly 3 units left and right the center, which places them at the points (-1, -1) and (5, -1). 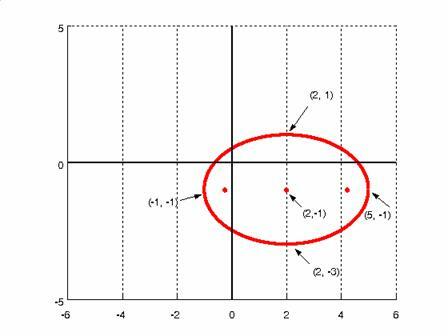 We also know that the endpoints of the minor axis are exactly 2 units above and below the center, which places them at the points (2, 1)and (2, -3).